It all began when John Eads moved to Portland in 2008 with no job prospects, a baby on the way, a semi-useless liberal arts degree and a smattering of food, business and art experience. He was quickly enamored with Portland’s food cart scene and opened Give Pizza A Chance in downtown Portland. After a few months serving pizza by the slice to downtowners, John became obsessed with the idea that really good pizza– Italian-style wood fired pizza– could be served out of an 8’x16′ food cart. He had the flatbed custom-built, cast the oven himself and built the cart around it with the help of some friends. 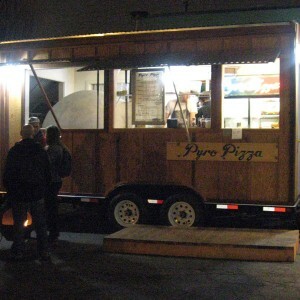 In November 2009 Pyro’s first pizzas were served. John also makes his own sodas using all real ingredients and natural cane sugar– never any high-fructose corn syrup, artificial colors or flavors. There are usually a variety of sodas on tap ranging from Natural Cola to Spicy Ginger Ale to Basil Lime. Since the beginning John has held to the belief that good ingredients make good food. That is why the crew makes many components in-house and sources regional flour from Shepherd’s Grain, pepperoni from Otto’s Sausage Kitchen, sausage from Nicky USA, blue cheese from Rogue Creamery, soda ingredients from Mountain Rose Herbs, seasonal produce from Gathering Together Farm, Garden Ripe Farm and Eat Oregon First. In 2015 Pyro expanded to open a new concept sandwich cart, Pyro’s Wicked Wiches. The same quality ingredients build the best scratch-made sandwiches, soups, chips and cookies to be found. While we have at times catered parties and events, we regret that we no longer have a mobile unit or the ability to cater.